As a skateboard car accident attorney in Los Angeles, I know that there are hundreds of incidents each year in L.A. where a skateboarder is struck and either injured or killed by a motor vehicle. People of all ages enjoy riding skateboards, and some do so as a means of transportation. Skateboarders in Los Angeles have certain rights in the event they are struck by motor vehicles. Because the weather conditions in Los Angeles are good year-round, the city has a high number of people who choose to ride skateboards. There are laws that govern safe skateboarding practices, but motorists still owe a duty of care to watch for skateboarders riding near them. Because people who are riding on skateboards have little protection when they are hit by cars, they are much likelier to suffer from serious injuries or to be killed when motor vehicles hit them. A majority of people who are killed while riding on skateboards each year are involved in accidents with motor vehicles. In 2014, 28 people across the nation were killed in skateboarding accidents. Of those, 23 were struck by vehicles, and three were engaging in a practice called skitching, which is when skateboarders hold on to a moving vehicle. In 2011, more than 78,000 people ages 19 or younger were injured in skateboarding accidents. 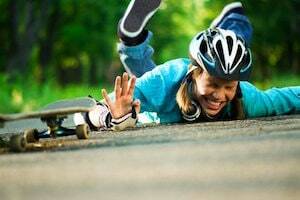 Around 52 percent of the skateboard-injury cases involve children who are ages 15 or younger, and 85 percent of those who are injured are males. Depending on the type of accident, injuries may include fractures to the wrists and arms, fractures to the legs, back or skull, sprains, strains, cuts and bruises. More serious injuries can occur when skateboarders are struck by motor vehicles, including multiple fractures, spinal cord injuries and traumatic brain injuries. The state, Los Angeles County and local cities within Southern California all provide laws and ordinances governing the safe riding of skateboards. Under the California Vehicle Code § 21212(a), all skateboarders who are younger than age 18 are required to wear helmets. Section 21968 prohibits the use of motorized skateboards on roadways, trails and sidewalks. Los Angeles County Code § 15.54.010 forbids skateboarding at speeds of 10 miles per hour or more as well as skating on roads or highways that have grades that are 3 percent or more. Cities in Southern California have a variety of different municipal ordinances that also prohibit certain types of skateboarding actions. The existence of these laws does not obviate the duty of care owed by motor vehicle drivers to skateboarders. Drivers owe a reasonable duty of care to observe their surroundings and to watch for pedestrians, skateboarders and cyclists. When they fail to do so and an accident results, they may be held to be liable through filed personal injury or wrongful death lawsuits if the person is seriously injured or killed. A recent decision from the Court of Apeal for the Third Appellate District of California sheds light on certain types of skateboard injury accident cases. In Bertsch v. Mammoth Community Water District, Super. Ct. No. CV120094, a young man was skateboarding down a hill when he hit an unsecured manhole cover. The court upheld the lower court’s decision granting summary judgment for the defendants, finding that the young man, who was killed, had assumed the risk of having such an accident because he was engaging in skateboarding at the time as a sport rather than as a means of transportation. The case can be distinguished from those involving motor vehicles. Drivers owe a duty of care to watch for skateboarders, and when they hit them, they may still be liable regardless of the reason the person is using the skateboard at the time. A personal injury attorney can advise you regarding whether the motorist appears to hold liability or not upon a review of the facts of a client’s case. If you or your loved one was seriously injured or killed in an accident involving a skateboard and a motor vehicle, you might want to consult with a lawyer who is familiar with claims involving skateboards and motor vehicles. An attorney may be able to advise you regarding liability, and he or she may agree to accept representation in order to help you recover if the motorist was negligent in causing the accident.